Elson Geaves (“We”) are committed to protecting and respecting your privacy. Our registered company number is 06906165 and our registered company address is 12 Haviland Road, Ferndown Industrial Estate, Wimborne, Dorset. BH21 7RG. Questions, comments and requests regarding this Privacy Notice are welcomed and should be addressed to gkearley@elsongeaves.com. If you wish to contact us by phone, the general number is 01202 581999. For the purpose of Data Protection legislation, the Data Controller is Elson Geaves Accountants Limited. The contact details of our Data Protection Officer are Gary Kearley, FCPA, Elson Geaves, 12 Haviland Road, Ferndown Industrial Estate, Wimborne, Dorset. BH21 7RG..
We will not collect any personal data about you from our website only statistical data will be extracted from any visit you may make. This policy outlines the behaviours and standards required of the; organisation, all employees, workers and third parties in relation to the collection, retention, transfer, disclosure, use and destruction of any personal data. must be taken to ensure data that are inaccurate, are erased or rectified without delay. data, including protection against unauthorised or unlawful processing, accidental loss, destruction or damage, using appropriate technical or organisational measures. – to perform a task carried out in the public interest or in the exercise of an official authority. If the organisation wishes to hold and process data which does not fall within conditions listed above then it will seek to obtain the consent of the individual. number, contact details for the purposes of accounts and taxation assistance and on occasions bank details. Individuals have the right to access to information stored about them. Employees can ask for access to their own personal details held electronically or held manually. Employees who wish to see their records should give notice electronically, in writing to one of the partners/Directors.The Company has up to 1 month to provide the information following the subject access request, which it will usually do in electronic format. The Company reserves the right to charge a fee or refuse to a respond to a request if it is manifestly unfounded or excessive. Similarly, the Company reserves the right to withhold personal data if disclosing it would adversely affect the rights and freedoms of others. Where an individual identifies that their personal data is incorrect, or incomplete or where they are aware that their personal data has changed, they must inform the organisation as soon as possible. The organisation will then take steps to rectify any inaccuracies as soon as possible, and at the latest within 1 month. In complex cases, or where there are numerous cases, the Company will liaise with the individual to inform them of progress, and if it is not possible to complete the request within 1 month, the Company will inform the individual of the delay and the reasons for the delay and reserves the right to extend the timescale for completion by up to a further 2 months. In the event that data has been disclosed to third parties, the Company will ensure that the request for rectification is communicated and actioned by the third party in line with the timescales outlined above, unless this is impossible or would involve disproportionate effort. If you wish to ask for your own personal data to be partially/fully erased and no longer processed, please write to a Director of Elson Geaves with full details of your request. The Company has up to 2 month to respond to you and either delete the data or explain why it is unable to comply with your request. Circumstances where the Company may be unable to comply include there it is required to retain the information by law, or if the data is needed in connection with legal proceedings. In complex cases, or where there are numerous related requests, the Company will liaise with you to inform you of progress, and if it is not possible to respond to your request within 1 month, the Company will inform you of the delay, the reasons for the delay and reserves the right to extend the timescale for completion by up to a further 2 months, if necessary. Any data breaches or near misses will be managed in the best interest of all concerned and if the directors feel the matter is serious will report to the Data Protection Agency for additional guidance. soon as data is no longer necessary for the purposes for which it was originally collected, it will be securely deleted, unless it is necessary to keep the data. All staff are responsible for data protection and should be alert to any actual, suspected, threatened or potential data protection breaches. As soon as a data protection breach has been discovered, where possible, the member of staff should report a Data Protection Breach to a Director (to the fullest extent possible at that time), which should provide full details concerning the breach. The report of the breach should then be reported to a Director as soon as possible and within 2 hours of the discovery of the breach. For more information regarding managing data protection breaches please refer to the Data Protection Breach Reporting Policy and Procedure. We confirm that whilst we will transfer your data to third parties and suppliers within the EEA, we will not transfer your data to a country outside the EEA. The Organisation has appointed a Data Protection Officer, who will support the organisation to manage Data Protection and will work with the Executive Board in this respect. Any queries or concerns can be addressed directly to the Data Protection Officer, Mr Gary Kearley. Any queries or concerns can be addressed directly to the Data Protection Officer on please include contact details. Elson Geaves is committed to managing and handling personal data in line with best practice and data protection principles. As such this Policy details the procedures to use to ensure timely and secure disposal of documents and records that are no longer required for business purposes. Elson Geaves holds a wide variety of personal data, for employees and clients, as well as financial data, HR data, marketing data, client data and so on, many of which include personal data. This data is held in various formats including; letters, emails, contracts, forms, software systems in both hard copy and electronic form. It is essential that this policy is adhered to, as premature destruction of documents could result in an inability to defend claims, business difficulties and failure to comply with data protection legislation, whilst appropriate destruction and disposal will ensure that the storage space is maximised and we are not keeping documents for an unnecessarily long period of time which would breach data protection legislation. This policy applies to all the information held by Elson Geaves and also any personal data that may be held by data processors (service providers) where they are processing information on the Company’s behalf. All staff are responsible for ensuring that the records that they create/maintain are accurate, maintained and disposed of in accordance with this policy. It is recognised that the documentation created and maintained by the Company will change over time and therefore this policy should be viewed as a living document and it will be reviewed on an annual basis, or as necessary, if sooner. 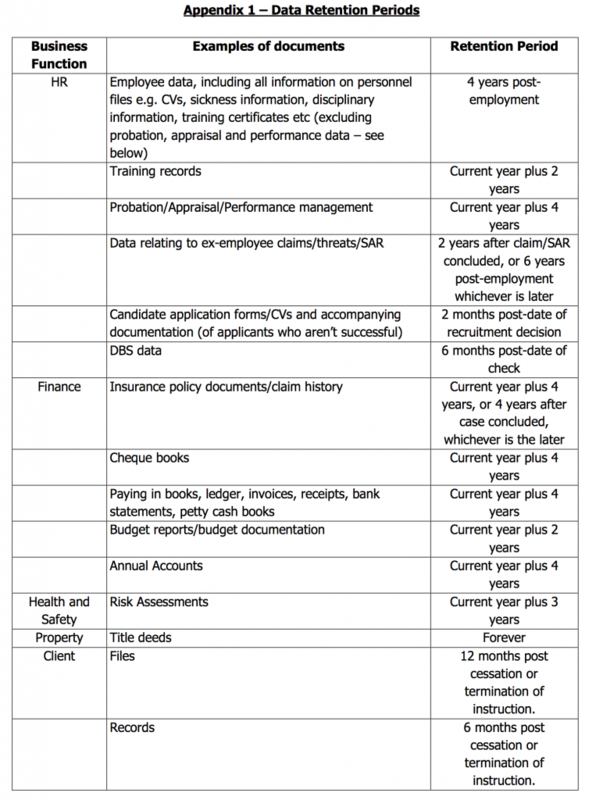 Appendix 1 details the retention periods for specific types of documents and records. Hard copies of confidential documents or personal data should be disposed of using the confidential waste bins and sacks. Under no circumstances should any personal or confidential data be disposed of in any other manner, as this would potentially breach data protection legislation. Disposal of documents which do not contain personal data or confidential information can be disposed of in any bin, or by recycling or by electronic deletion in the case of electronic documents. Documents that are destroyed must be done so using an approved confidential waste provider and records retained to support the sack destruction.